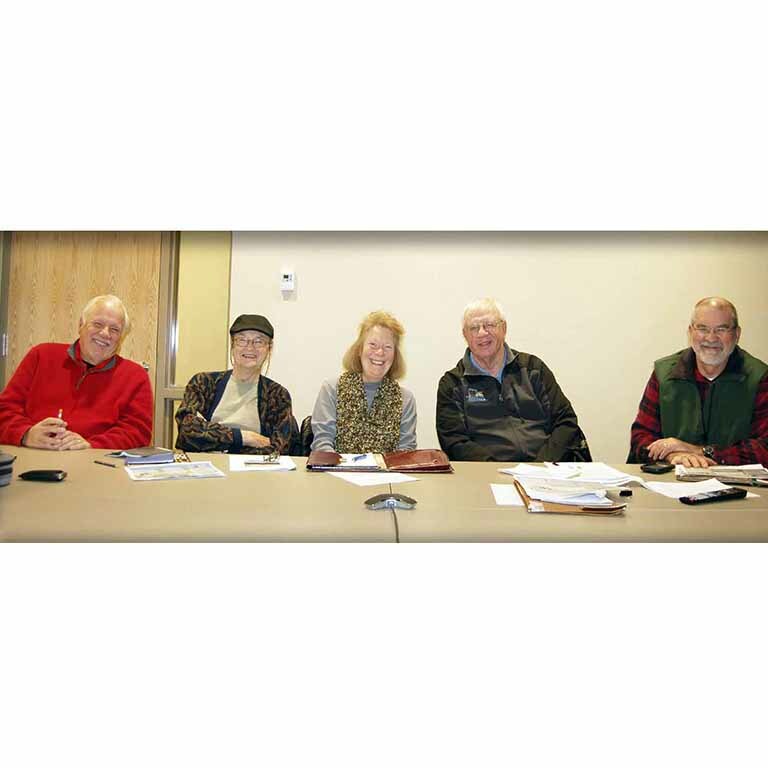 Members of COLA's Advisory Committee, from left: Lynn Goodrich, Jerry Knoblich, Sharon Natzel, Dan Kittilson, and Doug Kingsley. Photo by Carrie Hitchcock. For the second year in a row, the Hubbard County Coalition of Lake Associations (COLA) has been the beneficiary of an Indiana University (IU) master's degree capstone project, providing them with information to improve their organizational operations. The project, undertaken during this fall semester and entitled "Enhancing Hubbard County COLA's Lake Monitoring Program," follows an IU capstone completed in the spring of 2013. Initiated by COLA requests, both projects were done by students in the School of Public and Environmental Affairs (SPEA), under the direction of Dr. Burney Fischer, clinical professor at IU SPEA, and a summer resident on Big Mantrap lake. The first capstone generated sustainability recommendations for both lake associations and COLA, and, in addition to the formal research report, resulted in an article entitled "Analyzing and Improving the Sustainability of Lake Associations." The article appeared in the Summer 2014 issue of LakeLine Magazine, a quarterly published by the North American Lake Management Society (NA-LMS). (1) How do the actions of COLA and lake associations (LAs) affect their public image? (2) What is the best way to get people to engage in best practices in lake management, and how does this relate to lake-water quality? (3) What are the ways to aid in the recruitment and retention of members? Using two online surveys, one sent to COLA representatives, and one to individuals living on seven lakes in Hubbard County, certain categories emerged as important concerns of the respondents. Those categories included maintaining a positive public image; expanding water-quality practices; building membership, leadership and a volunteer base; and increasing fundraising. Although concern over public image was of primary concern for COLA survey respondents (due to a recent lawsuit and media articles), the lake residents surveyed held a positive view of COLA. Aquatic Invasive Species (AIS) was the number one specific lakes-related concern for both COLA and lake residents, that concern being one of 16 indices that were listed. The full report of this project can be viewed on a link on the COLA website's home page. Current COLA President Lynn Goodrich said that this capstone "helped us recognize our strengths and weaknesses," improved their communication through "a new more dynamic website," and gave them ideas on "how to build better relationships with other organizations and the community in general." He said he thought the recommendations from the project would help them "continue to protect the future environ- mental and economic health of Hubbard County and its citizens." As Goodrich explained, now that the COLA and LAs had information on how to sustain themselves as organi- zations, the current capstone focuses attention back to the lakes and their health. During a teleconference held on Monday, December 8, the students presented a summary of their project, assessing the current state of lake monitoring programs at both the COLA and LA level, to members of COLA's Advisory Committee. The students defined the parameters of lake monitoring, which generally include physical water quality traits, the chemical composition of the water, and biological components like plants and wildlife. They also reviewed terminology common to various aspects of lake monitoring. The group used literature reviews, phone interviews with personnel at state agencies like the Minnesota Pollution Control Agency (MPCA) and Department of Natural Resources, about barriers to and successes with effective lake monitoring, and developed a lake monitoring program (LMP) assessment survey. Of the 215 surveys sent out, the team received 84 responses from 21 counties, including Hubbard, which represented 11 COLAs and 54 LAs. Of those LAs, 27 were in Hubbard County, and 27 were from other counties in the state. Although the full report of this capstone is not yet available on COLA's website, preliminary results highlighted showed that Hubbard County's lake monitoring activities are similar to those in other counties, although the students suggested one area of potential improvement would be to engage in higher nutrient (nitrogen, phosphorous, chlorophyll-A), lake level, and water chemistry monitoring. The surveys also showed that the biggest perceived threats to water quality were nutrient pollution, AIS, development and erosion. The students pointed out there was some disagreement among The surveys also showed that the biggest perceived threats to water quality were nutrient pollution, AIS, development and erosion. The students pointed out there was some disagreement among same-lake responses as far as what lake monitoring activities their organization is actually conducting. They said there was more consensus to questions regarding AIS monitoring and secchi disk use (a secchi disk is a white circular disk, mounted on a pole and lowered into the water, which measures wa-ter transparency at the point the disc is no longer visible), which they said was likely due to those practices being more common. They added, however, that there was also some disagreement between what is outlined on the LMPs and what was indicated by the survey responses. Some of the team's recommendations to COLA included moving beyond the shoreline to address threats to water quality, including monitoring the watershed to to take into account the entire area around a lake; using the MPCA's Standard Operating Procedures (SOPs) for lake water quality sampling to ensure consistency; and to improve online LA contact information to facilitate better relationships with state agencies. What was described as "one of the biggest takeaways from this whole process," was that there was a disconnect in people understanding what is really happening on their lakes, and that following the SOPs and having current contact information would be two good ways to ensure better communication among lake residents, LAs and COLA as to the health of their lakes. Goodrich praised the IU students for the work on this capstone, and said that data gathered by water testing and vegetation mapping will allow COLA and the LAs to better understand the ecology of the lakes area and how it is affected by human presence. "Having a history of the low us to gain the involve-ment of state and local politicians and monies," he said. “Perhaps our greatest challenge is in getting the people to appreciate what they have, and to care enough to become involved."